Linday Whitney is Associate Professor and Chair of the Art Department at Valley City State University. Whitney is also an advocate for art education in schools, and has served on the Art Endowment Board of the Grand Forks Education Foundation. 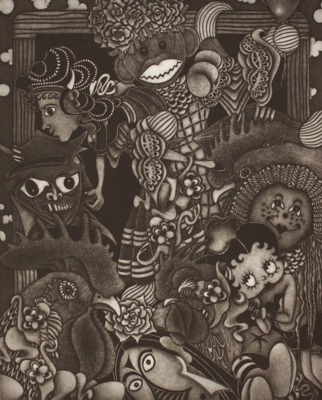 Her artwork often features “shadowmen”, figures from her imagination that allude to various Non-Western cultural influences. In this mezzotint, a print created with a pitted, textured copper plate, Whitney presents cultural icons that have impacted perceptions of identity, including Betty Boop and Aunt Jemima.